This dark brown mid-century armoire and two yellowish nightstands were brought back to life with a pale green distressed finish for Vanessa and Brian to accent their existing bedroom furniture. Her problem was she needed more storage in her bedroom but didn't want everything to match her existing dark wood dresser and bed. The solution was to paint the vintage armoire and night stands to match a pale green element in her bed cover, and then accent that with a faux finish and brown handles. I love to do special projects for my customers. It really gets the creative juices flowing. Bring me your furniture or just tell me about your decorating challenge. I can work with the inventory of unfinished products in my studio or brainstorm with you for possible solutions in the marketplace. Besides furniture, I do mirrors, lamps and chandeliers. Let the fun begin! Scroll down, there are a lot of stories. "We are so thrilled with the finished product! We could not have done it without your help! The creativity and details of your pieces really make the room! Thanks so much!". Tina, Madison's mother, contacted me from an ad in "The Leader". She had an old, sad, water damaged dresser, night stand and mirrors that she wondered if I could save. After several meetings and discussions about color choices, Madison made the final decision and this is the result. Quite a stunning change!! When Leslie contacted me she was downsizing from a 4 bedroom, 2 story home to a patio home on one level. Her existing furniture was dark brown wood and aging 1980's style, which she wanted to change to a relaxing beach color scheme. We started with a new round pedestal table with an antique white base and, rather than get rid of her 6 Ethan Allen cane back chairs, I painted and faux finished them to match the table base. The seat cushions were re-covered in a basket weave, soft turquoise fabric to match her theme color. In her kitchen I used the same turquoise color to paint an old drop leaf table. She added shear curtains, and Voila, a brand new look! Thanks Leslie for letting me help. Ali was starting her first job as an attorney and had just moved into her first apartment after college. From my inventory of unfinished products, I painted, shabbied and faux finished a black dressing table for her master bedroom and an antique French style bureau for her guest bedroom. For her kitchen I brought a mid century table and 6 chairs back to life with a glossy antique white, leaving the cane in its natural color. I covered the seats with a rose basket weave fabric and accented the table and chair legs with a touch of the same rose color. Ali, it was great fun helping you, and thanks for being brave with colors! Marie had a mid century hutch lanquishing in her garage and wondered if it could be repurposed to go in her guest bedroom. So I painted it red with and added a coffee bean faux finish to it. She now plans to use it to store books and computer equipment for the times her adult children come to visit. After Hurricane Ike damaged her beach house, Carol decided to rebuild from scratch and refurnish with both new and old pieces salvaged from the storm. She purchased a dresser and bench from my shop and realized she needed to keep going with a new design concept. Her new style became "rustic beach" with shabby chic white mixed with black. So I went to work on an old white iron bed and painted it black and added white shabby accents. Then came the surprise when her husband pulled up in my driveway with a load of log pine pieces of 2 twin beds. I was stunned at first, then after taking a deep breath, I said "I can do that!" The result is shown below...a stunning transformation. A local resale shop called me to say a customer was thinking of buying and painting a dark old corner cabinet herself. The shop recommended me to her. After several phone conversations about the details, the job of preparation was started. We never met until after the piece was completed. Vicki said, "Nancy, thank you for the wonderful job you did on my cabinet. I absolutely LOVE IT. I will tell all my friends about you". Tina contacted me last year shortly after purchasing a quiet getaway cottage where they could escape the hustle and bustle of Houston. Her dilemma was choosing colors to decorate a whole house at once. I encouraged her to repurpose her old furniture with fresh pastel colors. For an old brown TV armoire, we chose a light blue paint and in the process, determined it would accommodate a 42” flat screen TV, and placed it in the cottage style master bedroom. For the den, we repurposed an 1890s trunk painted yellow for use as a coffee table, and painted a 1960s stereo cabinet celery green to hold a large flat screen TV. It fit the room and the TV perfectly. Finally, her mother’s French style night stand was brought back to life with a faux finished antique white paint. Tina commented, "As always, I enjoyed working with you. You are so creative! I love all the pieces. I think the stereo is my favorite." I was recently contacted by The Women’s Home of Houston to update an old art deco buffet in their meeting room which had a gray and soft green/blue color scheme. 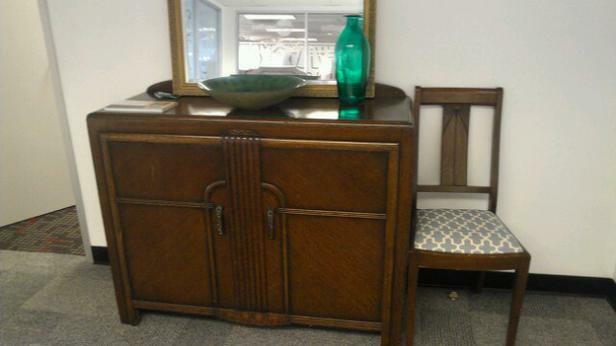 The old buffet had great bones and a wonderful deco design that was hidden under a dark stain. The before and after pictures show how those features popped out with a little gold gilding on a muted teal background. My husband recently built a spec house in Galveston and I decided to incorporate some of my work into the construction and then stage it with some of my shabby chic furniture.